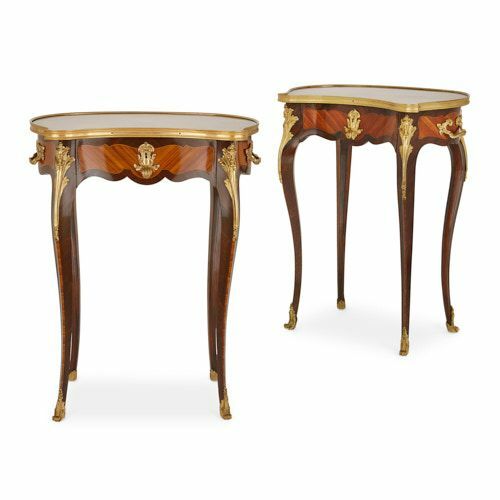 Crafted in the late 19th Century in France, these side tables feature beautiful parquetry compositions, mounted with ormolu satyr masks and scrollwork. This pair of French antique side tables consist of a shaped parquetry top and body, with ormolu handles and mounts, supported on four cabriole legs, which terminate in ormolu feet. 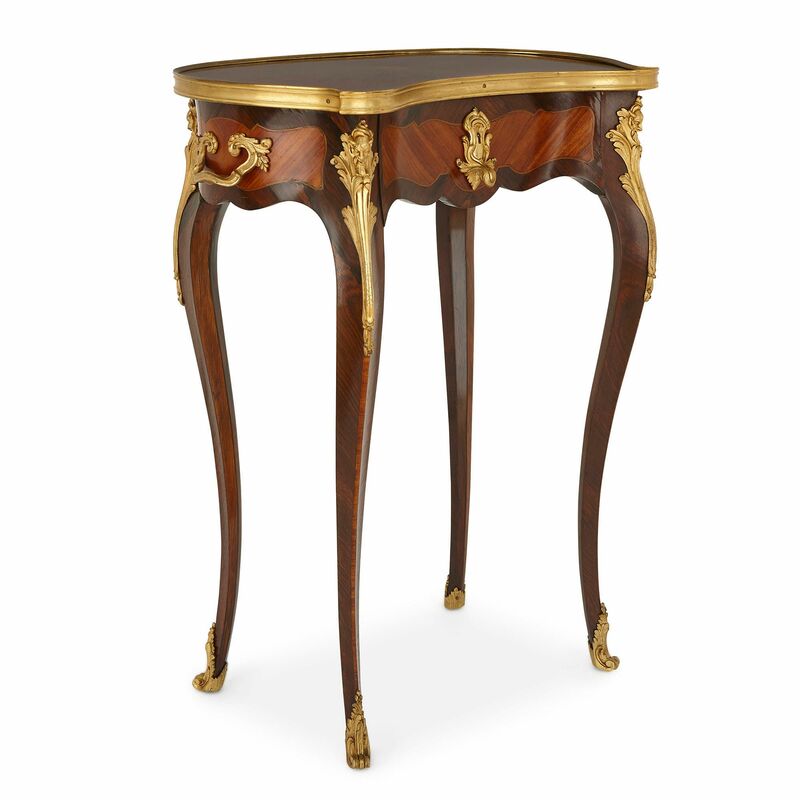 Each table is set on four scrolling feet, above of which are cabriole legs, which are quite angular in their shape. The legs have been veneered in rosewood, with lighter-coloured tulipwood used to articulate their front edge. 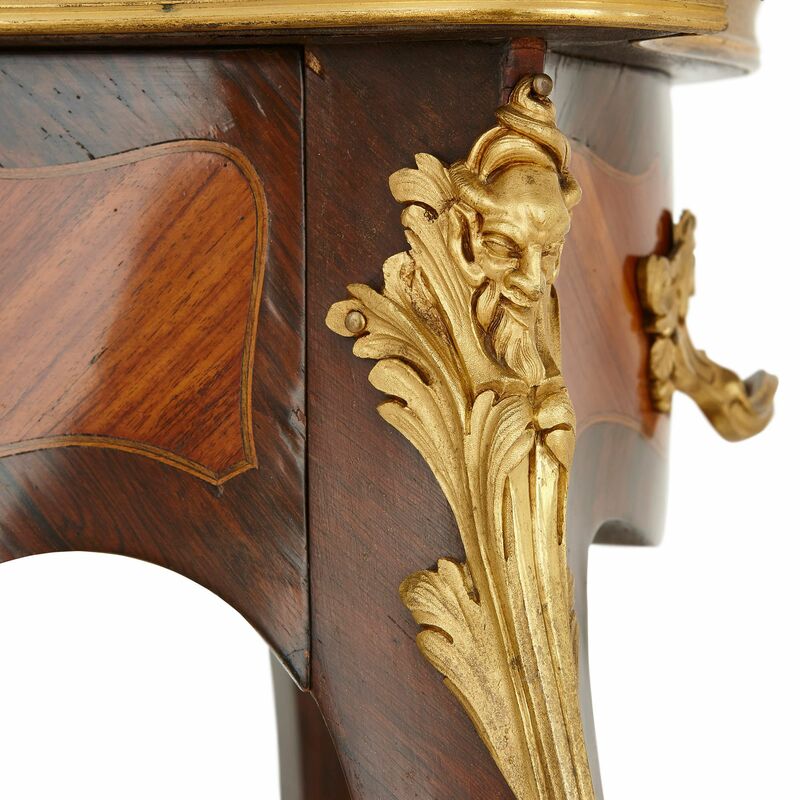 An ormolu grotesque mask depicting a grinning satyr, framed by foliage, tops each leg. 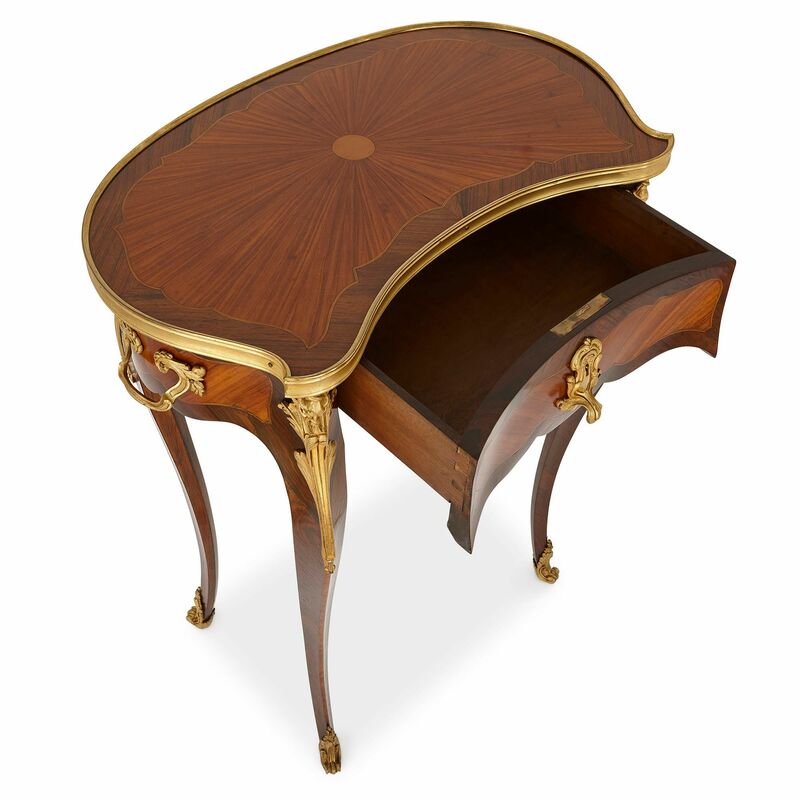 The table bodies have shaped aprons, which are decorated with tulipwood parquetry compositions. 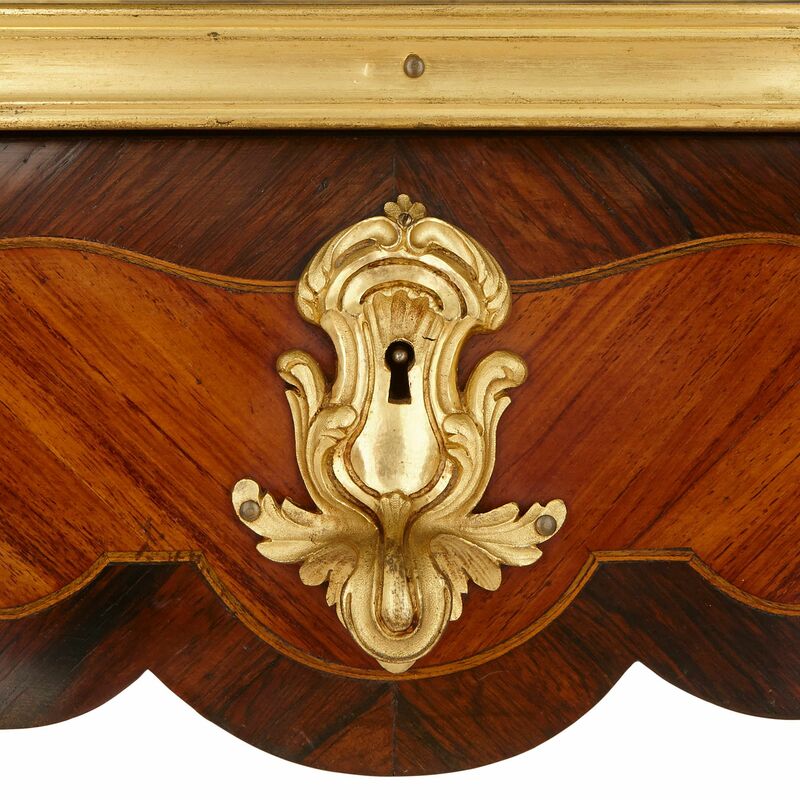 The centre of each front panel is fitted with an ormolu mount, which is cast as a stylised segmental-pedimented aedicule enclosing a keyhole. A scrolling finial at the end of each mount forms a knob which can be used to pull open the drawer behind. 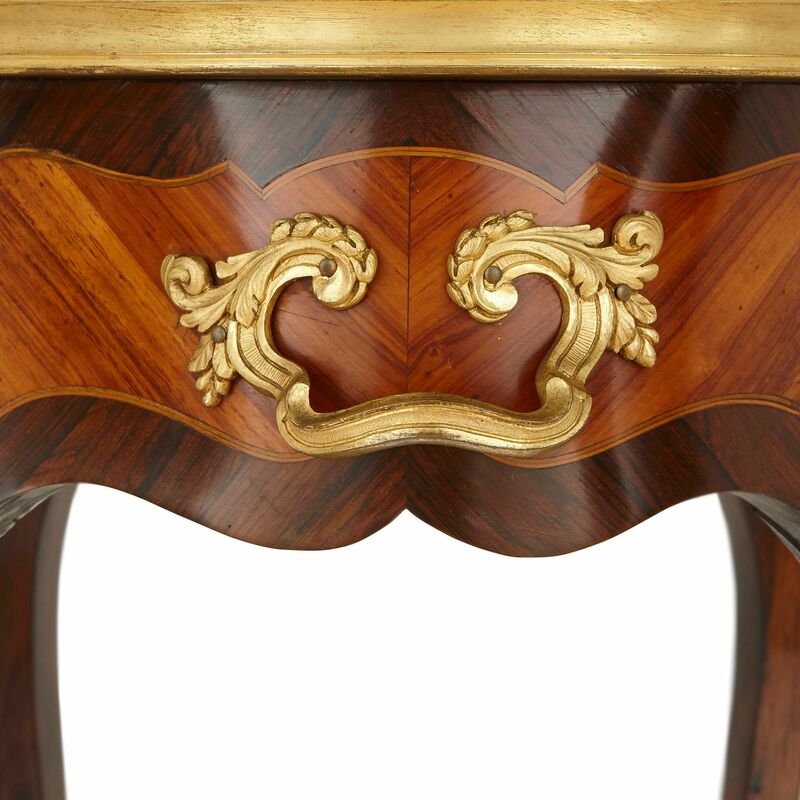 Two scrolling ormolu handles are fitted, one on either side of each piece. Above, the top of the tables are kidney-shaped, but with outward-flicking rather than inward-curving ends. These feature parquetry designs, where the grain of orange-toned wood panels are positioned so that they appear to radiate outwards from a circular centre point, crafted from a lighter shade of wood. This composition is bordered by a darker-coloured wood, and set within an ormolu frame.